So here's teh story - Opo or Indian Long Squash is massively on sale at teh supermarket. Not quite daikon radish cheap, but pretty darned cheap. I've never prepared it before but I had to give it a shot. Opo is a very, very bland vegetable. No flavour to it at all. But it has great texture - very similar to zucchini or summer squash. Traditionally, this vegetable is used in curries, probs because it does have so little flavour of its own and would make a fantastic vehicle for sauce. I didn't want to do this because I was afraid that cooking it at all would make it all mushy and ruin teh only characteristic it actually has. So salad. Teh other part is that we're introducing Ultra Ninja to new foods and it goes over better if we eat the same thing that she does. The latest food is cooked barley. Pearl barley is quite similar to brown rice, and sticking to the Indian theme as set by the long squash, dinner was butter chicken. 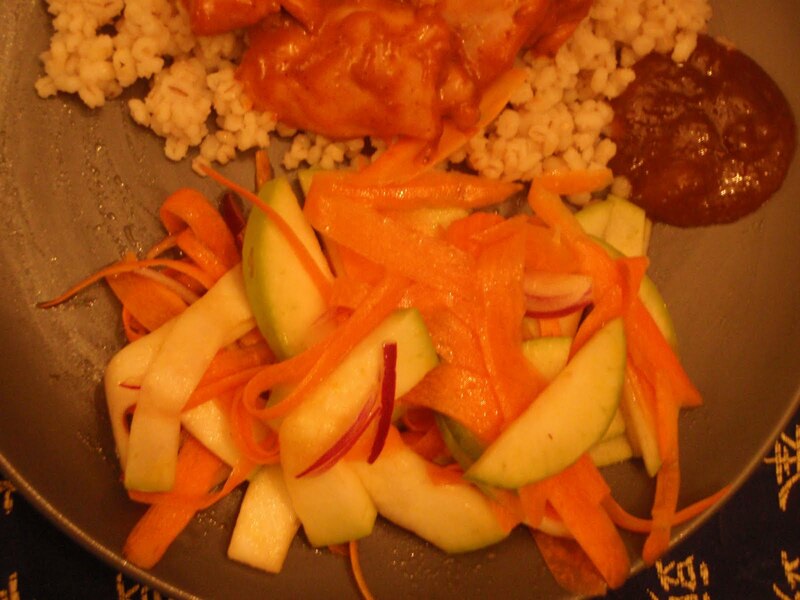 As I mentioned at teh Mothership, went with a sweetened rice wine vinagrette with a hit of Tabasco to dress the salad which was long squash, carrots and red onion. Tasted not bad, and looked awful pretty too. Something was missing, and I am ashamed to admit that I think what was missing was cilantro. Which I hate. Ugh. Verdict? Success, but room for improvement. Barley goes incredibly well with indian food. It's certainly not the same as basmati, but it does make a great base. 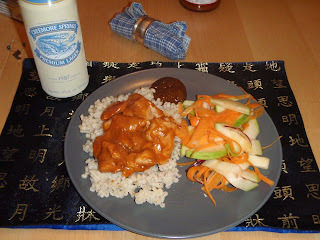 The slight elastic chewiness of barley (relative to white rice) is very nice with flavourful sauces. Don't know if I can say I prefer barley to basmati for indian food at this point, but it's nice to have an alternative. The salad went incredibly well with the butter chicken too. Although it (and I can't believe I'm saying this) would have been improved with cilantro. Lessons learned other than teh cilantro thing: You want to slightly overcook the barley so it's a little drier and more sauce hungry. There's an ideal thickness for Opo in salads like this. You want it thick enough so that it holds it's texture, but no thicker than that. Since it was my first run at it, I actually made a range of different thickness slices. 3 mm to 5 mm (1/8 to 1/4 inch for those more comfotable with archaic units) is the sweet spot. A yogurt dressing would have tasted great, but would also interfere with teh pretty colours in teh salad. Finally, if you're going to ask for advice about dinner prep, do it early enough that you can get in some marinating or a quick run to the market. Perhaps black mustard seeds would have been a good addition. I love vegetable poriyal, with shredded cabbage, julienned carrots, and grated coconut, with plenty of black mustard seeds. I know about the dressing interfering with the looks, but taste over beauty in my estimation. Or else, take pics, and then make it delicious.